MH17, one year later: Russia is still denying involvement. Did MH17 Change Anything in Ukraine? A photo taken on Sept. 9, 2014, shows flowers and soft toys left at a monument for the Malaysia Airlines Flight MH17 crash site in the village of Hrabove. 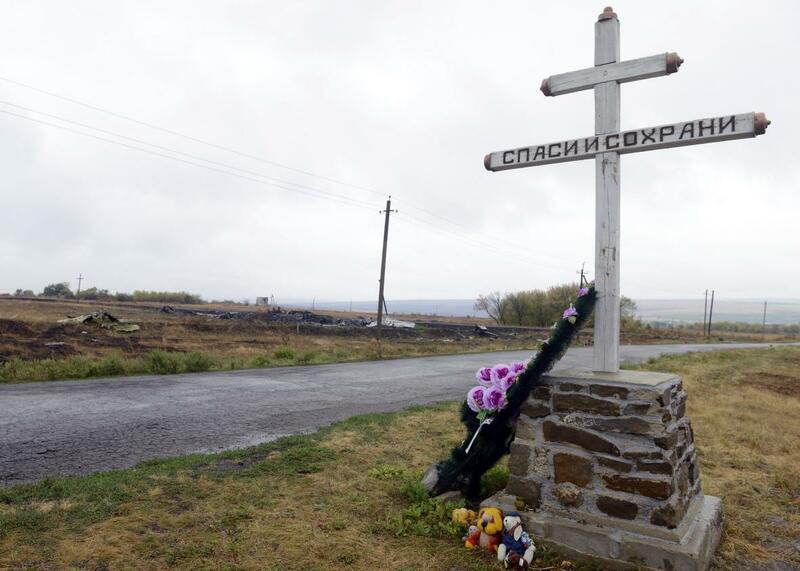 Today makes one year since Malaysia Airlines flight MH17 crashed near the village of Hrabove in eastern Ukraine. The anniversary has been marked by commemorations in the area, which has been the site of heavy fighting between Ukrainian government forces and Russian-backed separatists, as well as characteristically divergent interpretations from the governments involved. CNN reports today that a forthcoming report by Dutch investigators will conclude that MH17 was downed by a Russian-made Buk surface-to-air missile fired from rebel-controlled territory. According to CNN, the report, which has not yet been made public, explicitly blames the separatists, though it also faults Malaysia Airlines for not avoiding the conflict zone. Dutch Prime Minister Mark Rutte has called for a U.N. tribunal to investigate the incident and prosecute suspects. But Russian President Vladimir Putin called Rutte on Thursday to explain his position that such a tribunal would be, as the Kremlin puts it, “premature and counterproductive.” Putin also criticized what he called politicized media coverage of the incident. The Russian government has consistently denied that the rebels shot down the plane, just as it denies that it is supporting the rebels in the first place. From the beginning, the Russian media offered a variety of alternative explanations and theories for the crash, and a majority of Russians believe that Ukraine shot it down. A year ago I wrote that since Russia would never take responsibility for the action, and there was only so far other countries would go to confront it, the incident would likely have less of an impact on the conflict than many were predicting. (Some, at the time, were predicting that we were on the verge of a new world war.) In retrospect, I’d say I was about half-right. The crash did change attitudes about the conflict in Europe and galvanized EU governments to support much more aggressive economic sanctions against Russia—furthering the country’s international isolation. What’s less clear is the impact the crash has had on the ground, which is currently under a “ceasefire” that Ukraine accuses the rebels of violating as often as 100 times per day. The rebels aren’t pressing into new territory, as they were in the early part of this year, but Russia’s de facto control over the breakaway regions seems more unassailable than ever: The Ukrainian parliament today announced that upcoming local elections would not be held in the rebel-controlled east. And, as it was a year ago, the two sides don’t even agree on the reality of the situation, much less how to resolve it.